Anyone who played Rockstar’s outstanding Western epic Red Dead Redemption 2 last year doesn’t need me to tell them that the game was pretty much perfect on all fronts. It was visually stunning, told a gripping story with an unforgettable cast of characters in a detailed open world, and boasted an absolutely gorgeous soundtrack. 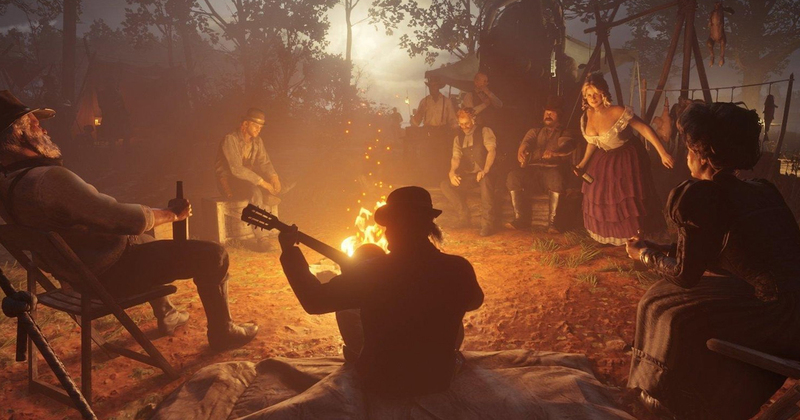 It’s no coincidence that RDR2 picked up awards for both sound design and score during the 2018 Game Awards. Great news for anyone who was left with a lasting impression of the game’s music then, as a recent live performance of The Music of Red Dead Redemption 2 is now available to watch in full. Check it out below. The show, which was led by Red Dead Redemption 2 composer, Woody Jackson, alongside contributors Senyawa, Colin Stetson and Petra Hayden, served as the closing installation for the Red Bull Music Festival in Los Angeles. If you’ve got a spare hour, it really is worth diving in to be taken away to the wild world of Arthur Morgan and his friends once more. Lord knows I’m not emotionally ready to actually go back and play through the game again, so this is the next best thing. A press release promises that the game’s original score and soundtracks will be getting official releases this spring, which is really awesome news. Look for both official releases of The Music of Red Dead Redemption 2 coming this Spring – the Original Score composed by Woody Jackson featuring contributions by Colin Stetson, Senyawa, Mario Batkovic, Arca and other guest artists, as well as the Original Soundtrack produced by Daniel Lanois featuring D’Angelo, Willie Nelson, Rhiannon Giddens and more. Now, if someone could just build me a time machine and take me back so I can actually see the performance live for myself, that’d be brilliant. Just slide into my DMs if you can help out.